MANILA, Philippines – (Updated July 31) The National Police Commission (NAPOLCOM) releases results of April 2018 PNP Entrance and promotional examinations: Police Officer (PO), Senior Police Officer (SPO), Police Inspector and Superintendent. NAPOLCOM Vice-Chairman and Executive Officer Atty. Rogelio T. Casurao said that a total of 15,191 candidates took the exam for various promotional test categories on Sunday, April 22, 2018 in several testing centers nationwide. View on this page for the complete list of passers for Superintendent promotional exams. The passing percentage rate for the Superintendent Exam is 21.69% (41 of 189 examinees). Vice-Chairman Casurao said that the low passing rate may be attributed to the Commission’s continuous upgrading of standards on its police examinations in line with its sustained effort to professionalize the PNP by ensuring that only the most qualified PNP personnel are promoted in the police service. 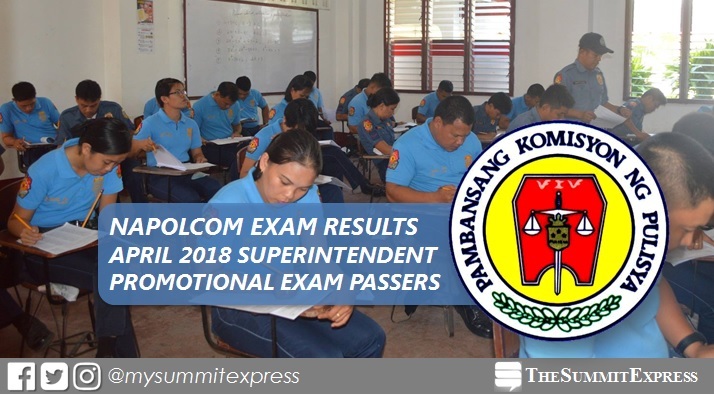 In the October 2017 exams, list of passers for Superintendent category was announced in two (2) weeks after the partial release of NAPOLCOM exam results. Only 43 takers passed the exams. In the April 2017 exams, results for Superintendent (together with Police Inspector exam category) were released on later date. NAPOLCOM named 118 who passed the promotional test.